On July 9th, 2012, Delta Air Lines leased 88 Boeing 717-200 jets after reaching an agreement with Southwest Airlines to acquire all of their AirTran 717 jets under a lease agreement. Delta began taking delivery of the Boeing 717 jets in September 2013 and is currently flying the jet in their fleet. A majority of the Boeing 717 planes AirTran / Southwest operated were leased from Boeing Capital, the financing division of Boeing. Most of the 717s that Delta is leasing show Wells Fargo Bank Northwest, NA (National Association) as Trustee for the true owner which is Boeing Capital. Southwest is leasing 76 Boeing 717 jets from Boeing Capital and has two 717-200s on a capital lease. Southwest owns ten Boeing 717s and is directly leasing those to Delta Air Lines. 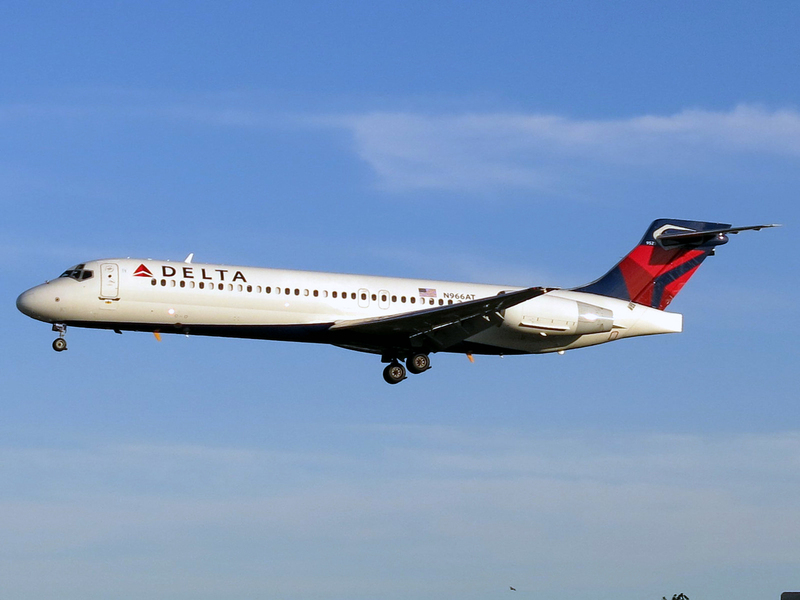 The rest of the Boeing 717-200 airplanes (78) are subleased to Delta. As a part of the deal Southwest will pay to paint all the Boeing 717-200s into Delta's livery and perform maintenance before delivering them to Delta. Southwest has estimated that it will cost them $154 million dollars (USD) to perform the painting and maintenance. Based on flight data, it looks like Southwest / Delta is sending the 717 jets to Flightstar Aircraft Services at the Cecil Airport (ICAO:KVQQ FAA:VQQ) in Jacksonville, FL for painting, maintenance and modifications. Delta Air Lines has received 45 Boeing 717-200 jets from Southwest / AirTran as of September 30th, 2014. Southwest is estimating that they will be able to deliver 3 717s per month to Delta. The company is expecting that it will deliver all of its Boeing 717 aircraft to Delta by mid to late 2015. Above Delta Boeing 717-200 photo by AEMoreira042281 on Wikimedia Commons. Modified by FlyRadius. Photo (only) released under a Creative Commons License. The Delta Boeing 717-200 has a total of 110 seats in a two / three class layout. Delta has a first class section that contains 12 seats that are 19.6 inches wide and have 37 inch seat pitch. The Delta Boeing 717 first class section is configured in a two by two seating arrangement and is located in rows 1 through 3. Following the first class section is Delta's Economy Comfort section, which is an economy section with extra legroom. There are 15 seats in the Delta Boeing 717-200 Economy Comfort class. The seats in this section have a seat pitch of 34 inches and are 18.1 inches wide. Delta's Boeing 717-200 economy class section spans from rows 13 to 29. The seats are 18.1 inches wide and have a seat pitch of 31 inches. Rows 19 and 20 are emergency exit row seats that have more leg room. Also row 20 only has one seat on the right and two on the left. This gives the widows seats on row 21 extra legroom also. Galley food carts are all located at the front of the airplane. Below is the seating chart. Also visit our Boeing 717-200 seating chart page to view the seat maps for the other airlines that operate the aircraft. All the seats inside the Delta 717 are built by Zodiac Aerospace. The first class seats are Zodiac Aerospace model 6810 and all the economy class seats are model 5751. The overhead bins on-board the 717-200 are regular sized for a mainline aircraft. They are much bigger then the overhead bins found on the Bombardier CRJ200, which Delta is phasing out with the Boeing 717-200 and other aircraft. The Delta Air Lines Boeing 717-200 has a total of three lavatories with one located in the front (for first class) and two located at the back of the aircraft. These restrooms should be regular sized for a mainline (non-regional) jet. Delta has installed WiFi internet service in the cabin of the 717 and it is available on all flights. Also 110 volt AC power with a USB plug is available at every seat. Delta is operating the Boeing 717-200 mostly from its hub in Atlanta, GA (ICAO: KATL, FAA: ATL) at the the time this article was written. AirTran's main hub was Atlanta also, so Delta is just transferring planes over to their side in Atlanta. Delta Air Lines is also starting to use the Boeing 717 on it's Delta Shuttle service between Boston-Logan International Airport (ICAO: KBOS, FAA:BOS) and New York LaGuardia Airport (ICAO: KLGA, FAA: LGA). Delta Shuttle is a special service that allows check in up to 15 minutes before departure and flights departing every hour during the day. Delta has also started 717 service from it's hubs in Detroit (ICAO: KDTW FAA: DTW) and Minneapolis/St Paul (ICAO: KMSP FAA: MSP). Delta has also put into its schedule that the 717 will fly on the west coast starting in June 2015. Delta Air Lines is going to operate the aircraft on the following routes: Los Angeles to Portland (LAX to PDX), Los Angeles to Las Vegas (LAX to LAS), Salt Lake City to Las Vegas (SLC to LAS) and Salt Lake City to Kansas City (SLC to MCI). To learn more about the Boeing 717-200 jet visit the other pages here on the site. Boeing B-717-200: the B-717 name is used by many, including the FAA, to refer to the Aircraft. Boeing B712: B712 is the ICAO code for the airplane that is used by air traffic controllers, airlines and others. More information on this will be posted later. Boeing 717 (with out the -200): Many call the 717-200 just the 717, which is the main aircraft program the plane is in (the only plane in the 717 program). 717 is also the IATA code for the jet aircraft.